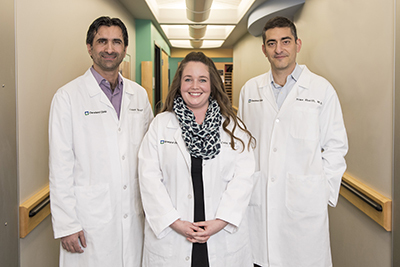 Mohammad Alyamani, PhD, and Kelsey Bohn, PhD, both postdoctoral fellows in the laboratory of Nima Sharifi, MD, Department of Cancer Biology, received Department of Defense (DoD) Prostate Cancer Research Program Early Investigator Research Awards. These prestigious awards will enable Drs. Alyamani and Bohn to contribute to the lab's innovative prostate cancer research while launching their own independent research careers. Dr. Alyamani will use his DoD funds to study how prostate cancer drugs are metabolized and how their byproducts (metabolites) may affect the progression of prostate cancer. The Sharifi lab recently found that patients with advanced prostate cancer and a specific genetic variant metabolize the drug abiraterone differently than men without the variant. Men with the genetic anomaly have high levels of a particular metabolite that can actually "turn on" pro-cancer pathways. With the DoD funds, Dr. Alyamani will use data from a previous study of abiraterone to correlate metabolite levels with clinical indicators of disease. The ultimate goal of the project is to uncover how drug metabolites may be used as biomarkers for patients at high risk for developing treatment resistance and may be better suited for different treatment strategies. In 2013, Dr. Sharifi discovered that men with advanced prostate cancer and a specific genetic variant are more likely to die from their prostate cancer. His team showed that this genetic variant enabled prostate cancer cells to use an alternative source of male hormones (androgens) when their first-line supply was depleted following androgen deprivation therapy. Dr. Bohn will use her DoD funds to investigate how these alternative androgren sources drive abiraterone-resistant prostate cancer. This award gives Dr. Bohn the opportunity to take a closer look at the mechanisms within the cancer cells that enable them to evade abiraterone treatment. To characterize what exactly occurs within the cells to confer resistance, she will intracellularly monitor enzyme activity and receptor signaling and will use CRISPR/Cas9 gene editing technology to identify genes important to resistance. These funds offer Drs. Alyamani and Bohn the opportunity to take the next step in their professional research careers. With continued guidance and mentorship from Dr. Sharifi, they will work to build a strong foundation for their own independent careers and labs. The DoD's Prostate Cancer Research Program—part of the Congressionally Directed Medical Research Program, which has many disease-focused programs—funds research into biomarker development, genetics, imaging, mechanisms of resistance, survivorship and palliative care, therapy, and tumor and microenvironment biology related to prostate cancer.